MY WONDERFUL HOME, which I have named Home Of The Dolphins (Casa De Los Delfines) is directly on the water overlooking the Malecon. IT IS LOCATED in the Middle of Downtown Puerto Vallarta 2 blocks from the main plaza, Plaza Grande, and because of that is walking distance to virtually every shop, restaurant and attraction that Puerto Vallarta has to offer. Its perfect for parties of up to 4 people, and of course is completely air-conditioned. Our building is 4 stories and has both elevator and stairway access. Home Of The Dolphins is located on the 3rd floor. THE VIEW IS FABULOUS, looking south all the way down the coast to Cabo Corrientes and north all the way to Punta Mita, the northernmost point of Banderas Bay. The dolphins delight in swimming directly in front of my terraza every day (hence the name 'Home Of The Dolphins'), and early in the morning the local oyster divers collect their day’s catch on the rich reef in the crystal blue waters directly in front of my home. With its abundant underwater sea life, snorkeling and swimming are unsurpassed in this area. BOTH BEDROOMS HAVE OCEANFRONT VIEWS, and the sunsets are truly amazing. If you are like me, you will spend both mornings on my main terrace, drinking your coffee and eating your breakfast watching the divers work and seeing the various seabirds hunt for their morning meal, and your evenings eating dinner at my handmade dining table that is situated outside on the covered balcony. The colorful waterfall fountain on our balcony can only accent the delight you will experience while taking in the 180 degree view of the ocean and coastline from one end of the bay to the other. Every night there is a fireworks display that is mounted from the Spanish galleon named the Marigalante, and usually the ship passes about 500 feet away from my balcony when it starts its show. There are 2 bedrooms each with its own separate bathroom. The bathrooms are all hand-crafted in marble. Both bedrooms have Kingsize beds in them. Both bedrooms have cable TV/DVD. English speaking Managers and staff. WE ALSO HAVE Free Wi-Fi High Speed Internet, so just bring your laptop and connect through your wireless connection and you are ready to go surf the Internet at no charge anytime of the day or night. HAND HEWN GRANITE countertops accent the custom designed kitchen, which is complete and has all the amenities to make preparation of meals a delight. UV Filtered water, Microwave, Blender, Coffee maker, 6 Burner gas stove, Large side by side refrigerator and dishwasher are all there, and various spices are always on hand. THE SWIMMING POOL is located on the roof of the building, just one floor above me, and the water is always warm and the view is unforgettable. Parking is Secured under the building, as my condo has the only underground parking in the city center, and the building has 24-hour security personnel to serve you. WE ALSO HAVE ONE of the best restaurants in all of Puerto Vallarta located on the ground floor of our building facing the beach on the new Malecon. Its name is VITEA, and you will be delighted when you have your lunch or dinner there. It is truly a 4 star restaurant and believe me, their Margaritas are the BEST in town! THINGS TO DO!! Virtually every water sport is available for you here in Puerto Vallarta. Also, there are horseback rides that take you back into the jungle where you will see waterfalls and flocks of parrots flying overhead. Golf is a major attraction here with several world-class courses. There are canopy tours in the jungle, you can visit the set of 'Terminator', and you can also swim with the dolphins, race mini cars and go to the local Seaworld, where the kids will have a great time. There are concerts every night by local artists in the main plaza, flea markets galore and special events where the local people from areas outside of Puerto Vallarta bring their local food and wares for you to taste and buy. There are numerous fabulous nightclubs and discos that are open until 4 in the morning, so you can dance the night away every night and never go to the same place twice. A note about Puerto Vallarta beaches; beaches are not always completely sandy. Although I cannot guarantee that the beach directly in front of our building will be completely sandy upon your visit, there are always plenty of sandy beaches for everyone within a block of our building. PLEASE NOTE: When you are checking the availability calendar, if HOME OF THE DOLPHINS is not available for your desired dates, please look at my other wonderful home named PENTHOUSE OF THE DOLPHINS because it may be available for the dates that you want. 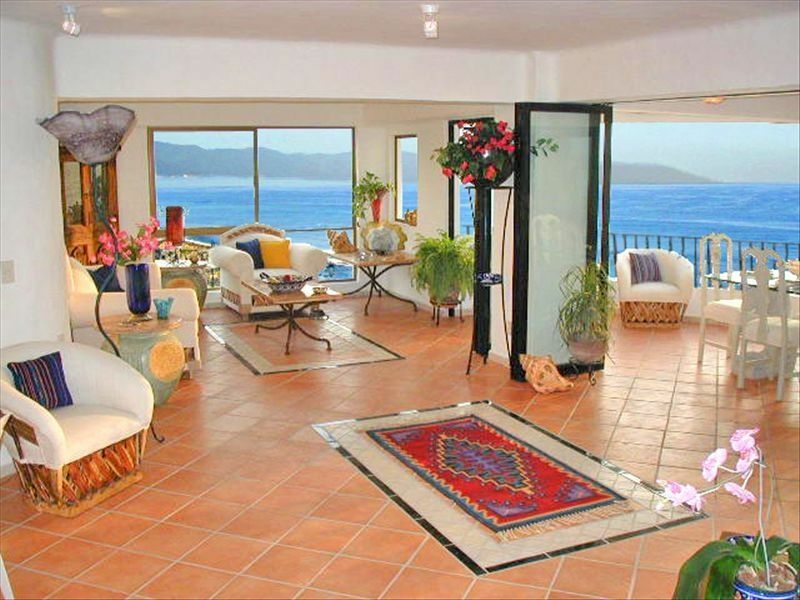 It is located just one floor above Home Of The Dolphins on the roof and is simply fabulous! Its listing number is 116585. You will have a great time no matter which of my 2 great properties you choose for your vacation. Please Note: If There Is Any Problem at all in the condo upon your arrival please call us IMMEDIATELY so we can fix it for you. GUEST SERVICES: Our main endeavor to you is to make sure your stay with us is the best it can possibly be. Our property manager is always on call for you and lives nearby. We will happily provide you with any information or help that you need with securing any outside reservations or services that you may desire such as tours or activities, zip lining or snorkeling, etc. Please note: All monthly rates are based on a 28-night stay. In case of dates crossing different monthly rates the higher monthly rate will apply to the entire period. When I arrived at my future home, walked through the entrada of the building and looked out and saw the azure blue waters of the Pacific and the incredible view of Banderas Bay right in front of me, I fell in love immediately. Being in the center of this wonderful town, I knew that this was the best location in all of Puerto Vallarta. I couldn't resist it. I Found Out that I could be just as secluded as I wanted as our building is very quiet, or I could enjoy a bounty of cultural and ethnic delights just by stepping outside. It was just up to me to decide what I would do on any given day, be a sun worshiper on the beach or at the pool, or join in the party that is always going on somewhere in this wonderful old colonial town. The views from my terrazas are unsurpassed, I can see the tourists strolling on the Malecon and I can also look out to the Pacific and see whales, dolphins, and even the oyster divers who like to work directly in front of home here. toilet, tub, shower, All Towels Provided and We Provide The Beach Towels! toilet, shower, All Towels Provided and We Provide The Beach Towels! 2 Full Bathrooms. All Towels Provided and We Provide The Beach Towels! Free Long Distance! Just Pick Up the phone and dial home any time of day or night. No extra charge. Each Room has its own Thermostat. Both the washer and dryer are located across the hall for your comfort and convenience. We have High Speed Internet and WIFI. Just turn on your laptop and you are automatically connected! The Deluxe GE Side By Side Stainless Steel Refrigerator Also Has An Icemaker And Double Filerted Water. The home comes fully equipped with telephones, linens, dishes, utensils and an Initial upply of soap and paper goods. The Handcrafted Kitchen is a delight; Granite Countertops, Hardwood Cabinetry, large Gas stove, Large side by side refrigerator, dishwasher and garbage disposal. All Matching Flatware and Silverware. We have a huge dining area on our lovely protected terrace plus a huge granite counter so that our guests can have breakfast and chat while the others are preparing the days delights. (2) Each Bedroom Has Its Own Cable TV/DVD. Stereo: We have wonderful mini component stereo system (LG Model FA166) and it has an Iphone/Ipod dock, CD player, portable USB flash drive and lots more. We have various CDs for your listening pleasure, or bring your own! We have about 40 titles from G to R rating, something for everybody. Our policy is bring a DVD and take a DVD. That way the library is always changing. Please Note: If There Is Any Problem at all in the condo upon your arrival please call us IMMEDIATELY so we can fix it for you. •	local activities guide •	restaurant dining guide •	local maps •	fitness room •	filtered water •	linens provided •	alarm clock •	ceiling fans •	staff •	hair dryer •	paper towels •	cold water dispenser •	toilet paper •	air-conditioning •	towels provided •	soaps - basic •	laundry soap •	massage •	++++++++++++++++++++++++++++ DINING: For the finest in dining, VITEA, one of the very best restaurants in all of Puerto Vallarta is located facing the ocean on the ground floor of our building. ******* I know that there are many Mexico vacation rentals, vacation condo rentals, pet friendly vacation rentals for you to look at, but I hope that you can see how wonderful my home truly is. It is my pleasure to help you in any way that I can. Great location. Amazing views. Slight problem upon arrival but the owner was very accommodating . We would stay there again! Our absolute favorite in PV, period. The kitchen with its countertops of huge chunks of marble (granite), heck, I don't know, is a delight to use if one is so enclined. The area is full of super restaurants so cooking at home is not at the top of our list!! We learned a new trick we've used on our last few visits. We get around by taxi but found that can be a roll of the dice. We found a driver we liked, he speaks English well and his assigned area is around the condo, in this case sitio 1. He seems to know every inch of the area. I now call his cell directly whenever I want to go someplace, near or far, and it's like having a personal driver. As I am a big guy I found his new but compact Toyota Rav type SUV much more comfy than an older small import sedan. Also, it handles the cobblestone roads in the area as well as possible......they call it a Mexican massage. I tend to tip well as in this case I find some of their fixed fees quite low---and it is definitely appreciated. 322-181-4304 is his number if you wnat to give it a try, his name is Jesus (hay-sus). Michel, the owner of Home of the Dolphins as well as the penthouse above it is absolutely a dream to work with, helpful in every way. I highly recommend this property for a delightful PV vacation. In fact, I am in the process of booking it again. If it ain't broke, don't fix it!!! Our recent week at Home of the Dolphins was divine! The best ocean views with a beautiful sunset every day. Our first time to PV so we wanted to be in the center of the action, and this condo is. We walked to great restaurants and entertainment shows every day, never needed a taxi. The full-sized kitchen allowed us to do breakfast on site. The building has excellent security, though it doesn't feel like it's needed. The condo is well-maintained, and the owner is very responsive. We are booking again for next year! nice place. great pool area and close to everything. The pictures don't do The Home of the Dolphins justice. The unobstructed views of the Pacific are fantastic, while the unit itself is beautiful, spacious, equipped with every amenity, and very well-maintained. It was a challenge every day to convince ourselves to leave, rather than just lounge around on the patio (from which, by the way, we saw several whales!) On the fourth floor of a very nice, also very well-maintained, small condo complex , you are literally on top of the Malecon. The location is easily the best in the Zona Romantica/Zona Centro. Everything is within easy walking distance, including most of the city's top restaurants and Los Muertos beach and pier. Aside from the unit itself and the location, another plus is Michel Rubini, the owner. Although not in town, his local representative was very reachable and responsive, as was he. The only negative (and this is entirely subjective) is that the ocean and the Malecon can be noisy--although not nearly as noisy and as chaotic as the Los Muertos beach neighborhood. Being from the midwest, we loved hearing the ocean, and didn't mind the constant parade of people passing several stories below--itself a real source of entertainment on occasion. However, if utter silence is what you're seeking on vacation, you're better off elsewhere. The Home of the Dolphins places you in the center of things, while at the same time provides a beautiful, relaxing refuge from which to soak it all in. PRIVATE YOGA CLASSES: For those of you who feel like relaxing and stretching a bit, we have a a fine, certified Hatha Yoga Teacher that is available in the privacy of the condo. Just give her a call 24 hrs. in advance and she will sooth your body and mind.